Your Clearlight Far Infrared Sauna is completely safe and produces the same far infrared heat produced by the sun. The Far-infrared heat is required for all living things for optimum health. The radiant heat from your Clearlight Far Infrared Sauna surrounds you and penetrates deeply into your joints, muscles and tissues, speeding oxygen flow and increasing circulation. 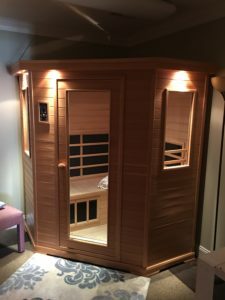 Using your Clearlight Far Infrared Sauna helps to remove impurities from your cells, specifically the cells inside our fat where our body stores waste and harmful toxins such as cholesterol and heavy metals. When used properly, your Clearlight Far Infrared Sauna will help provide a lifetime of healthful living. Integrative Reflexology - Reiki - Bio-Wave - Ionic Foot Detox - In Light Wellness - Chi Machine - Clearlight Infrared Sauna - Ozone Steam Sauna - EWOT - Magnetic Resonate Therapy - Nutritional Consultation - Hair Mineral Analysis - Bach Flower Therapy - Educational Health Seminars - Nutritional Supplements - Natural Skin Care - Homeopathies - Aromatherpy - Bodywork Massage Therapy- Echo H2 Water - .